The University of Lynchburg Concert Choir is going on tour, presenting fall concerts in Tidewater and Central Virginia. The tour begins on Sunday, November 9, with an 11 a.m. performance at Hilton Christina Church in Newport News and continues with a 7 p.m. performance at Virginia Beach Christian Church. On Monday, November 10, the choir will sing at 10:30 a.m. in Menchville High School in Newport News and at 2 p.m. in Amherst County High School. Dr. Jong Kim, professor of music and director of choral activities and vocal studies, directs the Concert Choir. He also serves as director of the master of arts in music program. Rose M. Peake will accompany the concerts. The concert program will include “Prelude” and “Ubi Caritas” by Norwegian composer Ola Gjeila; “Song of Triumph by Dale Grotenhuis; “Psallite” by Michael Praetorius; O Lux” by Audry Snyder; “In Time of Softest Snow” by John Carter; “Benedicamus Domino” byPeter Warlock, “Tshotsholoza” and “Let Everything That Hath Breath by Jeffery L. Ames; and “Think on Me” text and music by Mary Queen of Scots, arranged by James Mulholland. 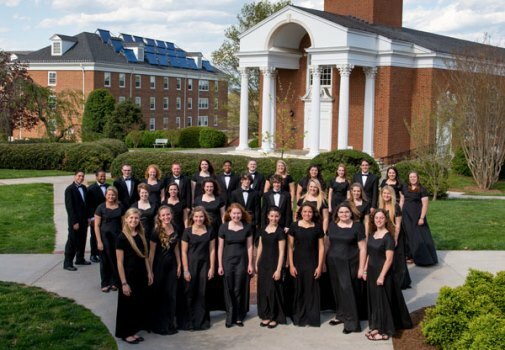 The Concert Choir is composed of student singers who are music and non-music majors enrolled in applied voice instruction at University of Lynchburg. Membership is by audition and is open only to students who meet the demands of voice, sight singing, overall musicianship and commitment. The University of Lynchburg Music Department is accredited by the National Association of Schools of Music (NASM) for both undergraduate and graduate programs.